where was this shuul located? He lived at 561 Gates Ave. in Bedford Stuyvesant. Why and when did he come from Eretz Yisroel to America? Any relation to Rebbe Yisroel Mensohn? As far as the research we were able to do back when Rebbe Yisroel Monsohn’s profile was on the table, the two of them are not related, the Rebbe Monsohn was a descendant from the Rizhiner and came from a well-known Galician Family of Philantropists. It appears that he moved later on to 14 Cook St. in which is closer to Williamsburg in Brooklyn, NY. As far as his biography, we know from his Matzieve that he was the son of R’ Abraham Leib Monsohn of Jeruslem, he also mentions that his FIL was R’ Chaim Zilberman. Rabbi Monsohn was a 4th generation Jeruslemnite, His Father Reb Avraham Lieb Monsohn was himself born in Jeruslem, to his father Reb Yoel Yosef Shimon Monsohn B”R Avraham Lieb (# 1) who was Niftar in Jeruslem in 1870. (there are photos of the two, when you go through the Biographies). The family ran a printing business in E. Yosroel. After Gates Ave he lived on Cook St. in Brooklyn, which is closer to Williamsburg. No conection to Rebbe Yisroel who was Galician). it has been already discussed on ivelt that they are not closely related. the Monsohn family was a huge family and one of them married the daughter of the Rizhiner. 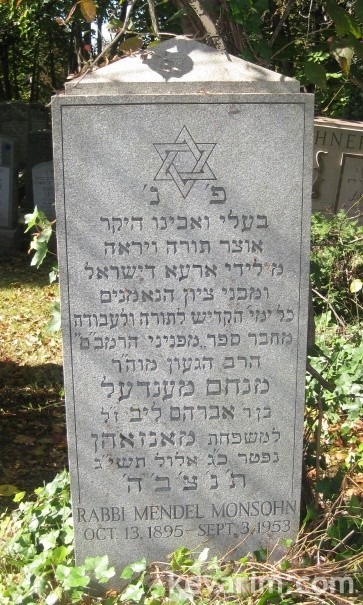 Reb Menachem-Mendl za”l was my maternal grandfather. Along with his brothers and sisters, he was born in Jerusalem. At age 18 he received smilkhe from Harav Kook. For a while he worked at the Monsohn Lithographic Press established in Jerusalem by his father, Reb Avrom-Leyb (II) and uncle, Reb Moyshe-Mordkhe. But he objected to the press’s printing of a calendar for one of the Jerusalem churches; and when printing started he stuck his hand into the press to stop the printing. As a result his hand was badly injured. In the 1920s, unable to find work as a rabbi in Jerusalem, he decided to emigrate to the U.S. He was appointed rabbi of a Brooklyn shul and a few years later brought his wife, Tshipe, and children (including my mother, Chaye Masha Gitl) to Brooklyn. He eked out a living, devoting most of his time to work on his Mipnine Harambam, which he printed himself. A new beautiful Hebrew edition was recently published in Jerusalem. Thanks so much for putting that excellent photo of my grandfather’s tombstone on the net. I now live in Jerusalem but was able to visit his gravesite last year while I was in NY.